With the big Royal Wedding coming up, it’s hard to ignore the ongoings of the Royal Family. Especially when you have a British Mum. My Mum always had something to say about the Royal Family when we were growing up. I can remember her commenting on many big royal events: the death of the Queen Mum, the retirement of the Royal Britannia, anything to do with Wallis Simpson or King Edward VIII (My Mum told she she cried and cried when King Edward VIII abdicated the throne in 1936) or trips around the world by Queen Elizabeth. My Mum was the expert on all things royal in our house! So, it’s no surprise that I have inherited my mum’s interest in this fascinating family. I will be watching the ceremony this Saturday and wishing my Mum was around to watch it with me. I will certainly enjoy the music, admire the Bride’s dress and try and spot the most unusual fascinator, but, like most foodies, it’s the cake that I’m particularly interested in. I’ve seen some photos of Royal Wedding Cakes in the past and they are utterly stunning. 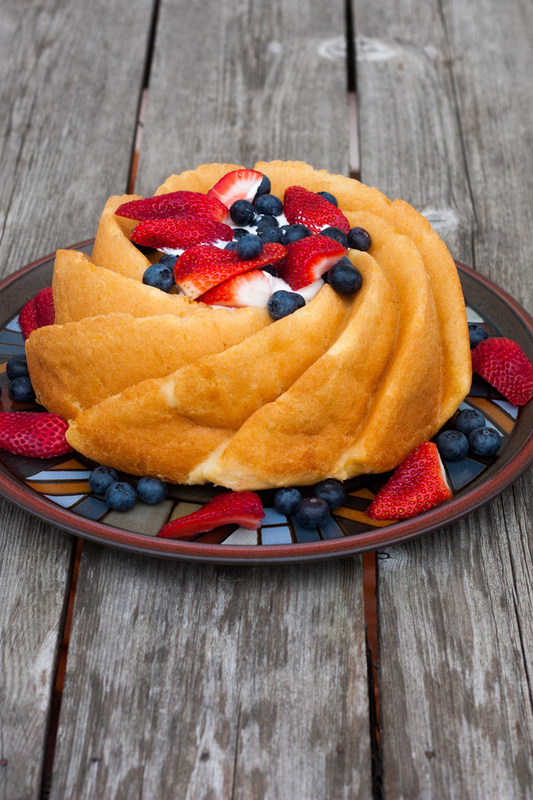 I chose a Savarin cake, because cakes soaked in a sweet syrup after baking are some of my favorites. 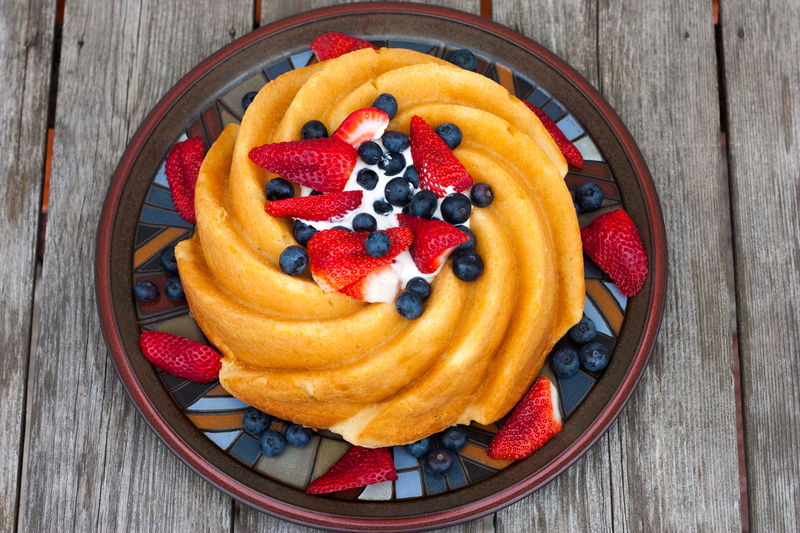 This cake pairs exceptionally well with fresh fruit and a dairy topping which is so perfect for mid-morning noshing. 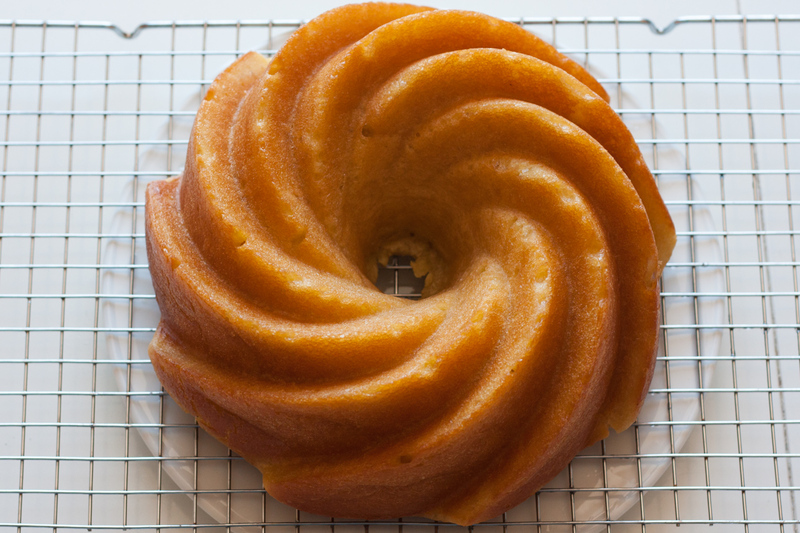 Savarin Cake is interesting because it is made with yeast and not with baking powder or baking soda. The batter is left to rise first in the mixing bowl and then transferred into the cake pan where it is left to rise 3/4 of the way up the pan. 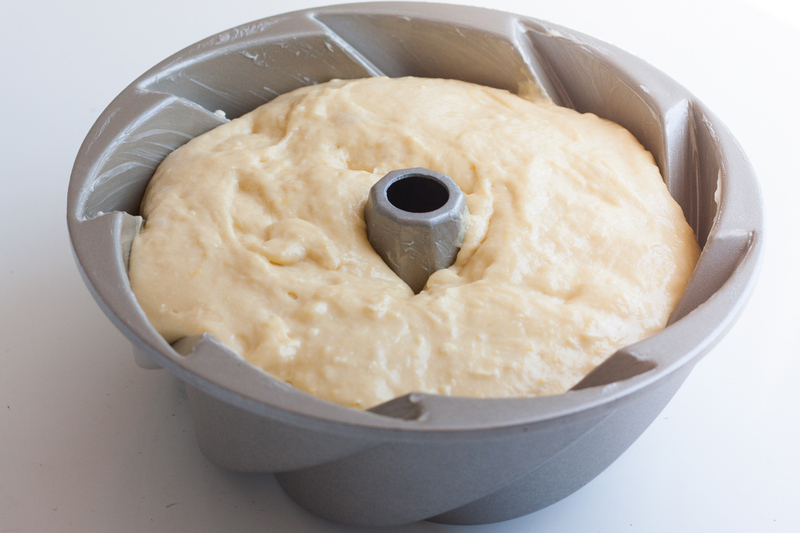 The batter is baked in a greased bundt or savarin cake pan in a medium hot oven for about 30 minutes, until a light golden brown. When the pan has cooled down a little, turn the cake out onto a cake rack, with a plate underneath. Pour the sugar syrup over the cake. I filled my Lemon-Elderflower Savarin Cake with whipped yogurt and cream topped with fresh blueberries and strawberries. 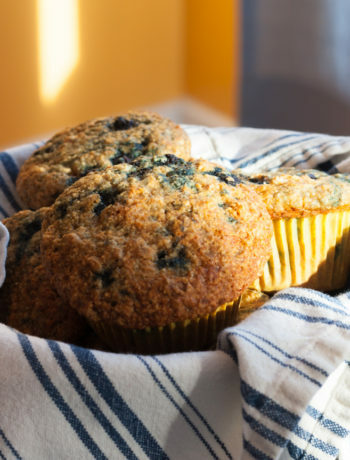 It’s delicious anytime of day! While Savarin cake is not British, it does have an interesting history behind it. FOllow the links at the end of this post for more informatiin about this delicious cake. The Royal Wedding will take place on May 19th at t St. George’s Chapel at Windsor Castle. Click on the link below to read up on this very interesting relic. Enjoy the event! I’m sure it’s going to be fun! If you enjoy reading about food history, here is some interesting information on Savarin Cakes. Proof the yeast in 2 tbsp water. Mix the eggs, then add the lemon juice. Add in the yeast. Add this egg mixture into the flour and sugar and mix until combined. Add in the softened cubes of butter, one piece at a time, until the butter is fully incorporated. Add the lemon zest and stir until incorporated. Cover bowl with cling wrap and let sit for one hour to rise. 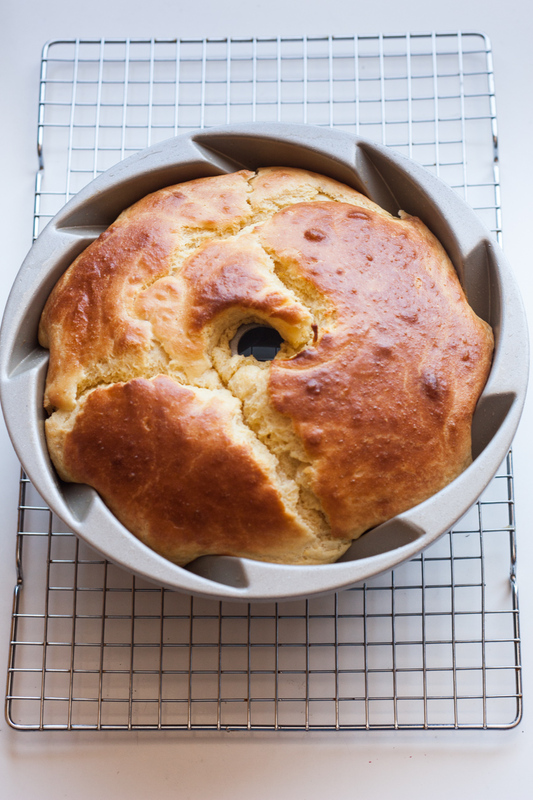 Grease bundt or savarin pan. Spoon batter into pan. Let sit for 45-60 minutes until risen 3/4 of the way up the pan. Place pan in oven and bake for 25-35 minutes until a light golden brown. When pan has cooled slightly, turn cake upside down. Pour 3/4 of the sugar syrup into the empty cake pan, then place baked cake back into syrup filled pan. Leave for 3-4 minutes. Carefully, turn cake out of cake pan onto wire rack and place on top of a plate. Leave cake to cool completely, letting syrup drip through onto the plate. 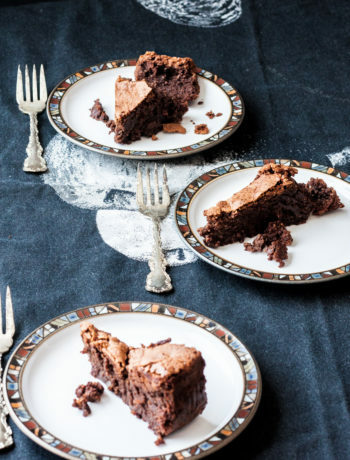 When the cake has cooled completely, place it on the plate to soak up any remaining syrup. For the Topping: In a mixer bowl, add 1 cup of greek yogurt, 3/4 cup of whipping cream, 3 tablespoons of maple syrup. 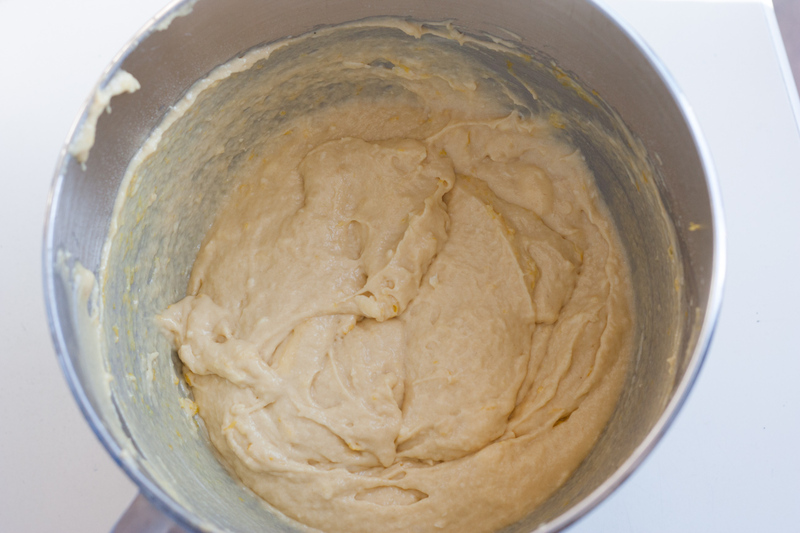 Turn mixer to medium high and whip until desired consistency is formed. 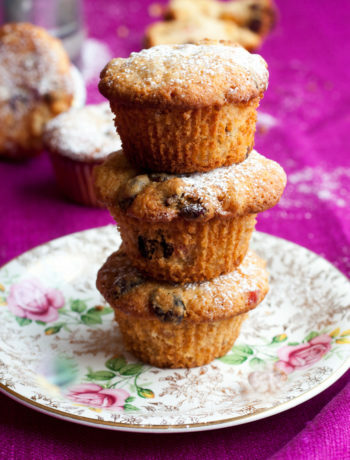 Fill centre of cake with topping and pile fresh fruit on top.